Reading and share top 12 famous quotes and sayings about Funeral Day by famous authors and people. 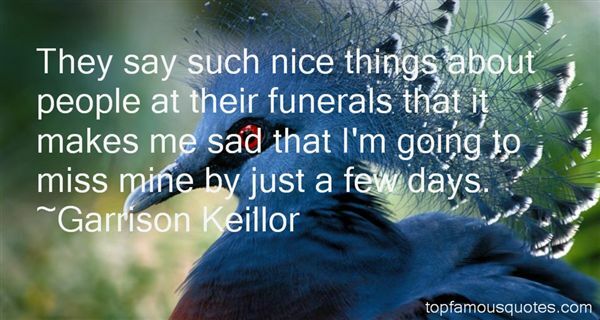 Browse top 12 famous quotes and sayings about Funeral Day by most favorite authors. 1. "I've been to many funerals of funny people, and they're some of the funniest days you'll ever have, because the emotions run high." 2. "Emily suffers no more from pain or weakness now. She will never suffer more in this world. She is gone after a hard, short conflict...Yes there is no Emily in time or on earth now. Yesterday we put her poor, wasted, mortal frame quietly under the chancel pavement. We are very calm at present. Why shoud we be otherwise? The anguish of seeing her suffer is over; the spectacle of the pains of death is gone by; the funeral day is past. We feel she is at peace. No need now to trouble for the hard frost and the keen wind. Emily does not feel them." 3. "Give me a funeral over a wedding any day,.' said Uncle Montague with a sigh. 'The conversation is almost always superior." 4. "He looked through the bars thoughtfully, then back at me. "I'll never forget how she went to you after Lois's funeral that day," he said. "She's a very intuitive little girl, and that moment told me something about you. ""It did?" I asked.He nodded. "It told me you're someone worth fighting for," he said." 5. "Friends: not one. Just a few acquaintances who imagine they feel something for me and who might be sorry if a train ran over me and the funeral was on a rainy day." 6. "They say such nice things about people at their funerals that it makes me sad that I'm going to miss mine by just a few days." 7. "Have just been run over by tram-car at Patriarch's Ponds funeral Friday three pm come. Berlioz." 8. "Oh, I believe you. It's too ridiculous not to be true. It's just that each time my world gets stranger, I think: Right. We're at maximum oddness now. At least I know the full extent of it. First, I find out my brother and I are descended from the pharaohs and have magic powers. All right. No problem. Then I find out my dead father has merged his soul with Osiris and Why not? Then my uncle takes over the House of Life and oversees hundreds of magicians around the world. Then my boyfriend turns out to be a hybrid magician boy/immortal god of funerals. And all the while I'm thinking, Of course! Keep calm and carry on! I've adjusted! And then you come along on a random Thursday, la-di-da, and say, Oh, by the way, Egyptian gods are just one small part of the cosmic absurdity. We've also got the Greeks to worry about! Hooray!" 9. 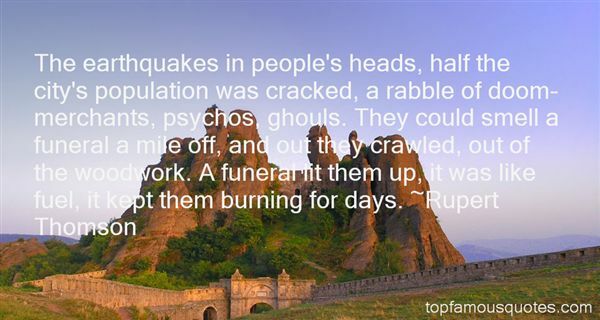 "The earthquakes in people's heads, half the city's population was cracked, a rabble of doom-merchants, psychos, ghouls. They could smell a funeral a mile off, and out they crawled, out of the woodwork. A funeral lit them up, it was like fuel, it kept them burning for days." 10. "The dirty secret she'd learned about grief was that nobody wanted to hear about your loss a week after the funeral. People you'd once considered friends would turn their heads in church or cross to another side of a shopping mall to avoid the contamination of your suffering. "You might imagine I'm coping day by day," she murmured. "But it's more a case of hour by hour, and during my worst times, minute by minute." 11. 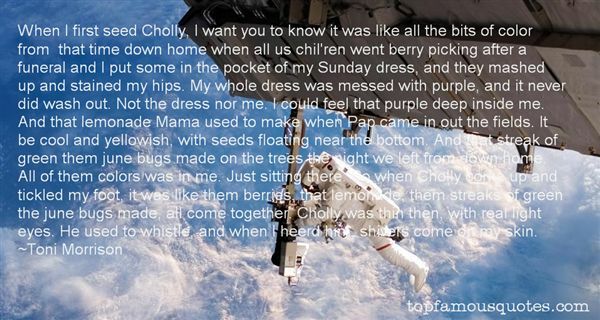 "When I first seed Cholly, I want you to know it was like all the bits of color from that time down home when all us chil'ren went berry picking after a funeral and I put some in the pocket of my Sunday dress, and they mashed up and stained my hips. My whole dress was messed with purple, and it never did wash out. Not the dress nor me. I could feel that purple deep inside me. And that lemonade Mama used to make when Pap came in out the fields. It be cool and yellowish, with seeds floating near the bottom. And that streak of green them june bugs made on the trees the night we left from down home. All of them colors was in me. Just sitting there. So when Cholly come up and tickled my foot, it was like them berries, that lemonade, them streaks of green the june bugs made, all come together. Cholly was thin then, with real light eyes. He used to whistle, and when I heerd him, shivers come on my skin." 12. "Funeral BluesStop all the clocks, cut off the telephone,Prevent the dog from barking with a juicy bone,Silence the pianos and with muffled drumBring out the coffin, let the mourners come.Let aeroplanes circle moaning overheadScribbling on the sky the message He is Dead.Put crepe bows round the white necks of the public doves,Let the traffic policemen wear black cotton gloves.He was my North, my South, my East and West,My working week and my Sunday rest,My noon, my midnight, my talk, my song;I thought that love would last forever: I was wrong.The stars are not wanted now; put out every one,Pack up the moon and dismantle the sun,Pour away the ocean and sweep up the woods;For nothing now can ever come to any good."